J. Goddard & Son lorry & car hire, 1935. Homepage. This page: Daimler car and five-ton commercial vehicle hire in London, during the mid-1930s. J. Goddard car and lorry hire. 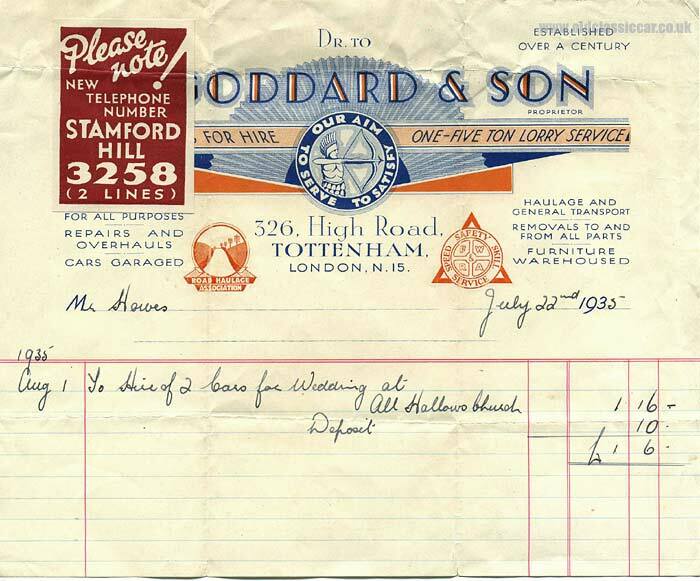 The illustrated invoice shown below dates to the mid-1930s, and relates to the hire of two cars for a wedding at All Hallows Church on August 1st, 1935. The invoice itself dates to July 22nd, a week or so before "the big day" was due. The cost for the hire of two cars was £1 16s, and a deposit of 10s had been paid. Whether J. Goddard & Son provided the drivers, or just the Daimlers, isn't clear. They operated from an address on High Road, Tottenham, in London, and offered Daimler Cars, and also one five-ton lorry for hire - make unknown. Modern cars for all purposes. Goddard & Son were members of both the RHA (Road Haulage Association) and FW & RA (???). Their slogan - "Our Aim - To Serve - To Satisfy" - suggests they offered a quality service to pre-war motorists in the London area. The only online reference I can find to a firm of this name is in The National Archives (Kew), where there are documents dating to 1953 for "Alec Joseph Goddard and Percy George Goddard T/A J. Goddard & Son" with reference to the Transport Act of 1947. The same firm? No specific address is given in the record summary, but it seems likely. As for the address, 326 High Road in Tottenham, it now seems to be occupied either by a fashion emporium, or an off-license. More information regarding the owners of this business. In 2012, Roger Goddard contacted me after having found this page on the site which relates to his family's former business, as he now describes. "I see that you made reference to my family's firm. My father was Alec Joseph Goddard and his brother was Percy George Goddard. They took over the management from their father upon his death from cancer in the 1930s. The Goddards had been in Tottenham from the late 1700s. As I understand it, they had a dairy at Broadwater Farm in Tottenham. They were also corn and coal merchants in High Road Tottenham." "During WW2 my father was moved to the Tottenham town hall where he was put in charge of transport for the war effort. The areas around Tottenham had a number of furniture factories [Lebus] and he arranged transport of plywood components for aircraft. Hoover - the vacuum cleaner company - made propellers for aircraft. Percy Goddard remained at the family firm and maintained the lorries. During that period they were co-ordinating I believe up to 100 trucks. Both brothers carried out fire watching when not at work." "In 1947 the business was nationalized. Both worked for the government until 1949. By that time they had had enough of Frank Cousins, the local union organizer, so decided to go back into business. They bought Clanver End Farm (CB11 4UL) and later the Cosh Farm at Duddenhoe End. The area was chosen because Alice George, their Mother, was from Bury Farm Langley, in Saffron Walden, Essex. Joseph Winterly Goddard had met Alice George when he took his wagon and horses into the county to buy hay and straw. The invoice you show dated 1935 was hand-written by my father. I still live at Clanver End Farm." Thanks for getting in touch Roger, it's great to hear from people who have connections with these old items that go onto the site. Return to the Motoring Collectables section for more items relating to vintage and classic cars, garages and related businesses.